It might be a bit of a first world problem but jet lag can be brutal and even ruin a trip. Jet lag equals serious sleep deprivation, which means that you simply can’t function normally – tricky if you have to work. The tiredness alone can cause lethargy and irritability, but it can also trigger anxiety. Constipation or diarrhoea are not uncommon, and neither are headaches, nausea and indigestion. One usually has a general feeling of malaise. To add to this, air travel also has its effect on us both physically and psychologically. And then there are the physical side effects such as leg swelling, headaches, and ear ache due to the changes in air pressure. But the good news is that, while there is no magic wand to do away with jet lag completely, there are things you can do to considerably reduce it. 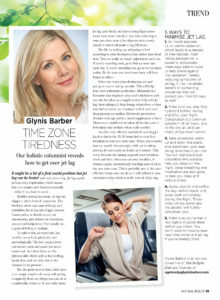 If you suffer from jet lag quite badly, and have a long flight across many time zones ahead of you, then adjusting to your new time zone a few days or even a week ahead of travel will make a big difference. Do this by waking up and going to bed according to your destination time rather than local time. You can make an hours’ adjustment each day. If you’re travelling west, go to bed an hour later each day; if you’re travelling east, go to bed an hour earlier. By the time you travel your body will have begun to adjust. This will help reset your melatonin production. Melatonin is a hormone that regulates sleep and wakefulness and can also be taken as a supplement to help with jet lag. Start taking a 2-3mg dosage about three or four days before travel, and continue with it until your sleep pattern normalises. However, it should not be taken all the time and is best taken only at times when really needed. Another very effective method of avoiding jet- lag is to fast in the 12-16 hours before your first breakfast in your new time zone. When you consider that we usually fast overnight while we’re asleep anyway, it’s not nearly as drastic as it sounds. This works because the fasting suspends your circadian clock and then, when you eat your breakfast, it resumes again, automatically resetting your clock to the new time zone. This is probably one of the most effective things you can do as it will influence your circadian clock, which is at the root of all jet lag. Air travel exposes us to cosmic radiation, which leads to a release of free radicals. Start taking astaxanthin, a powerful antioxidant, three days before travel to help shield against this radiation, thereby reducing symptoms of jet lag. It has the added benefit of containing properties that will protect you from UV rays as well. Make sure you stay fully hydrated before, during and after your flight. Dehydration is a common symptom of air travel, due to the dry air, and can make jet lag much worse. Take occasional walks up and down the plane, and stand near your seat doing stretches if you can. This will improve blood circulation and possibly help you sleep on the flight. Deep breathing and meditation are also good to help you relax and reduce stress. Avoid alcohol and coffee the day before travel, and avoid both completely during the flight. These make jet lag worse and the alcohol will further dehydrate you. Make sure you’ve had a few nights of good sleep before you travel. You don’t want to have to face new time zones and jet lag if you’re already tired.